Struggling to choose between ConvertKit vs ActiveCampaign? In this post, we’ll go hands-on with each service to help you pick the one that’s right for you. Both of these platforms are popular, well-regarded email marketing services. They help you build an email list, create and send messages, and automate many necessary parts of your campaigns. Choosing between the two requires looking carefully at what each has to offer, and considering your unique needs. To help you make a decision, we’ll compare the two based on features, pricing, ease of use, and potential for integration with WordPress. Let’s take a look! Email marketing is an excellent way to build and nurture your blog’s audience. Before you can get started, however, you’ll need a dedicated email marketing tool. There are a lot of options, but we’re going to focus on two. The first is ConvertKit. This is a dedicated email marketing platform, which focuses on providing services to busy creatives. It offers an app-based system with lots of automation features, to take the work of running your email campaigns largely off your hands. Next up, we have ActiveCampaign. This is a more comprehensive service, offering email marketing tools along with a whole suite of other features. What you get access to depends on the plan you sign up for. Regardless, it’s a flexible platform that gives you a lot of control over your campaigns. Now, let’s dig a little deeper into both services. We’ll compare them in four key areas to help you decide which one best suits your particular goals and needs. It’s crucial to make sure the service you sign up for includes the features you’ll need. Given this, let’s check out what ConvertKit vs ActiveCampaign have to offer. Helps you build and grow an email list for your campaigns. Makes it possible to organize your email list with taxonomies such as tags and categories. Offers customizable sign-up forms to embed on your website. Lets you create custom rules and sequences for automating your emails. Provides tools for tracking data about your subscribers and conversions. Integrates with many e-commerce platforms and other tools. Helps you build and manage an email list. Includes a drag-and-drop email designer that lets you fully customize your messages. Offers lots of templates to help you start building your emails faster. Lets you perform split testing easily, so you can perfect your campaigns and increase conversions. Enables you to personalize content based on each contact’s details and history. Simplifies the process of collecting and organizing data on the leads in your email list. Provides features that help you automate your campaigns and schedule them in advance. While both platforms have covered all the basics, there are some clear differences in their feature sets. ActiveCampaign provides more when it comes to building your emails and tracking data. In contrast, ConvertKit offers more precise automation and segmentation, as well as lots of integration options. 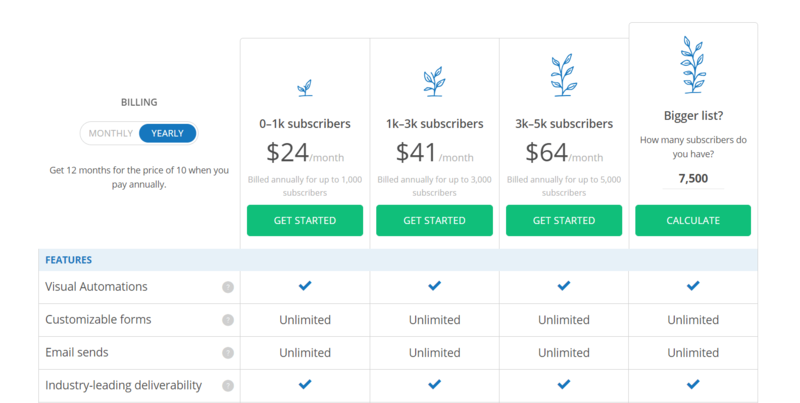 As you can see, the cheapest plan will cost you $24 per month for up to 1,000 subscribers (paid yearly). On the upper end, you can enter whatever size list you need in the final box, and calculate a price automatically. Other than that, ConvertKit’s plans are essentially identical. Every key feature is included on all plans. The only difference is the highest-level option, which provides free migration if you’re moving your existing email list from another service. This is important to remember because ActiveCampaign divides its billing tiers differently. The box to the left lets you choose how many subscribers you want your plan to include – anywhere from 500 to 100,000+. When you do this, the prices for the four plans will change dynamically. You can end up paying anywhere from $9 per month to thousands of dollars, depending on your needs. The four plans also differ widely in how many features they offer. At the lowest tier, however, you’ll get all the basics you need for email marketing. Overall, if you aren’t looking for anything too complex, ActiveCampaign can be a bit cheaper than ConvertKit. Your WordPress blog is an invaluable tool when it comes to building an email list and running successful campaigns. While neither ConvertKit vs ActiveCampaign is WordPress-specific, both offer dedicated integration plugins. This tool lets you embed a sign-up form on specific posts or pages, or include it at the bottom of every page on your site. It’s kept regularly updated, although there are very few user reviews. It lets you place your subscription form on any posts, pages, and/or widgets you like. This plugin also has few reviews, however, and has gone some time without an update. Ultimately, your mileage may vary when it comes to WordPress integration with ConvertKit vs ActiveCampaign. We have to give an edge here to ConvertKit, since its plugin is more flexible and kept up-to-date, but you’ll want to test either option thoroughly on a staging site before using it. With that being said, there are a number of quality third-party email opt-in plugins that you can use to integrate with both ConvertKit and ActiveCampaign, so you aren’t limited to using the official plugins. Finally, let’s talk about what it’s actually like to get started with ConvertKit vs ActiveCampaign. Both have a free trial, so you can check them out without making a commitment. There’s a lot to do here, but it’s all well organized. You can use the Getting Started widget at the top of the screen to check all the key tasks off your list one by one – adding email addresses to your list, creating your first campaign, building an opt-in form, and so on. This dashboard also has a lot of useful widgets, so you can see how your campaigns are doing at a glance. It displays your latest stats, recent activity, any tasks you’ve set for yourself, and more. To be honest, this dashboard is significantly less useful. There is a convenient checklist feature that will show you all the tasks you’ll want to tackle initially, and lets you check them off as you go. Other than that, there isn’t much to see here. However, the basic functions are organized clearly via the navigation menu at the top of the page. Each section will walk you through the related task – setting up automation, creating an opt-in form, etc. – and includes helpful videos to get you started. 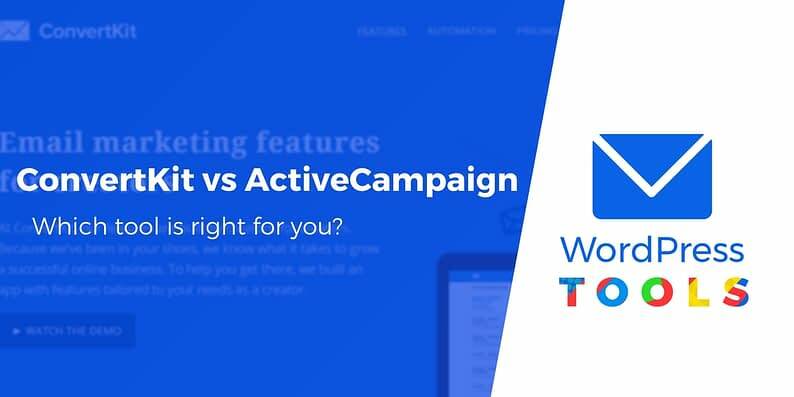 ConvertKit vs ActiveCampaign: Which service should you choose? ConvertKit. This service offers somewhat more when it comes to automating your emails and setting them up to respond to specific triggers. Plus, all its features are included even with the basic plan. Its pricing options are less flexible, though, and the dashboard is quite basic. ActiveCampaign. With this service, you can fully customize your plan, so you aren’t paying for more than you need. It offers an extensive dashboard, and lots of options for customizing your emails and tracking their results. Overall, ActiveCampaign has an edge here. It’s a bit cheaper, more flexible, and offers a better overall user experience. For most WordPress blog owners, ActiveCampaign is the email marketing service to opt for, especially if you’re willing to embed a sign-up form manually via code or use a third-party email opt-in plugin. ConvertKit isn’t to be overlooked, though. If you want a tool that offers complete control over your email automation, or if you like the uncluttered feel of the dashboard, it’s also a solid option. Choosing the right email marketing tool can be a challenge – there are so many options and factors to consider. For WordPress blog owners, however, there are a few services that rise above the pack. ConvertKit: A streamlined email marketing service with fewer options, but a lot of automation-related functionality. ActiveCampaign: A flexible and comprehensive tool, which is well worth checking out for most WordPress blog owners. And if you want even more options, you can consider our GetResponse vs AWeber comparison for a look at two more popular email marketing services. Have you ever tried either of these services, and what was your experience like? Tell us all about it in the comments section below!